but I finished my son's birthday cake! He's seven today, and as I mentioned yesterday, I can hardly believe how fast the years have gone. 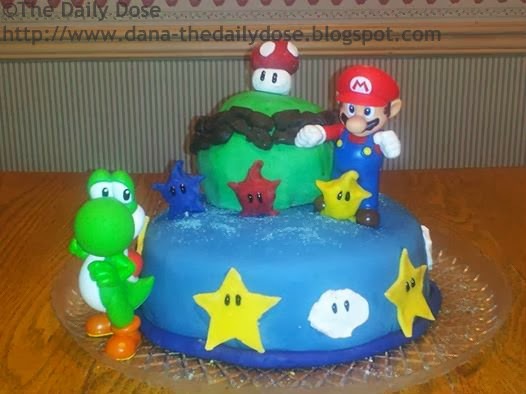 He requested a Mario cake again—a year has passed, and he still needs his Mario fix!—so I made this one, which is loosely based on his favorite game right now, Super Mario Galaxy 2. Thanks, Madeline. It was a great day. We all had a lot of fun. That cake is fabulous. Too bad it took so much time. Hope you have fun today. Yes, funny, nice cake! Happy Birthday to your son! Thank you. ☺ I'll pass your birthday wishes on to my son. Firstly, I think my boyfriend will want that cake. I'll tell him he can't have it though haha. Secondly, its their first trip to the theater? Thank you. My mom took me to see The Lion King when I was two. I was so excited and loved baby Simba so much, I kept running down the aisle to be as close to the screen as possible and then running all the way to the top VIP section (that my uncle pulled strings to get us in) for food. She said people thought it was cute. After seeing kids run around like that myself, I now know better. Anyone who waits until their kid knows how to sit still deserves a parade thrown. Well, I'm sorry I missed yesterday's post, but that cake is adorable! awww happy birthday to your sonand what an adorable cake! i too am going to the lego movie tomorrow taking the grandsons! I want a slice!! Or two. LOL Where do I send them? What a cake! I remember my children's first movie. Have a great time. That's is one amazing looking cake!! how cool..
Have a great day, and great weekend!! I hear the Lego movie is really funny. Enjoy! Thanks, Joy. The movie was great—definitely funny! Wow, that is incredible, Dana! I'll bet he loved that. Thank you! We had a fun time. It definitely felt like a long wait for us, too! Thanks, Betty. I'll pass your birthday wishes along to him. The movie was excellent; it had a really good message for the kids. I'd probably watch it again, but not until I can see it at home. Movies have really gotten expensive! Wow. That is an awesome cake. We just saw the Lego movie too. I really liked it. I wasn't expecting that ending at all, but loved it. At the beginning I thought it was so weird that the guy's name was Business, but it makes sense then by the end. It really was a great ending! I like the whole message there. I saw the Lego Movie a couple of days ago. Liked it a lot. And that cake is amazing - you are very talented, and I'm a little ashamed I've bought my son's cake for Tuesday. I'm surprised by how much I liked the movie. I'd love to see it again! Happy birthday to your son! What a wonderful cake! You are a great mom. That's very sweet of you to say. Thanks, McGuffy Ann! Happy Late B-day to your new 7 year old!! We all had a great time. :) Thanks! That cake looks amazing! Your kids are very lucky. Glad you all had a fun time celebrating your sons birthday. That is a brilliant cake. Could you make me one too? Oh gracious! This is amazing! You are really talented. Your son is very lucky.